Puno, (3,827 metres, 12,555 ft.), is the capital of the department of Puno on the shore of Lake Titicaca, south-eastern Peru. It is set in a rough terrain with cold and dry, weather and an annual average temperature of 9°C (48°F), going down to 3°C (37°F) during the winter. Founded as a silver-mining town by the Spanish in 1688. It is also famous for its folk music. The plateau's earlier settlers were mainly the Aymara people, with the Collaos and the Quechuas came later. According to legend Manco Cápac and Mama Ocllo, emerged from the waters of the Lake Titicaca to found the Inca empire. The Aymara civilisation was the most important and influential before the Spanish conquest of the region. 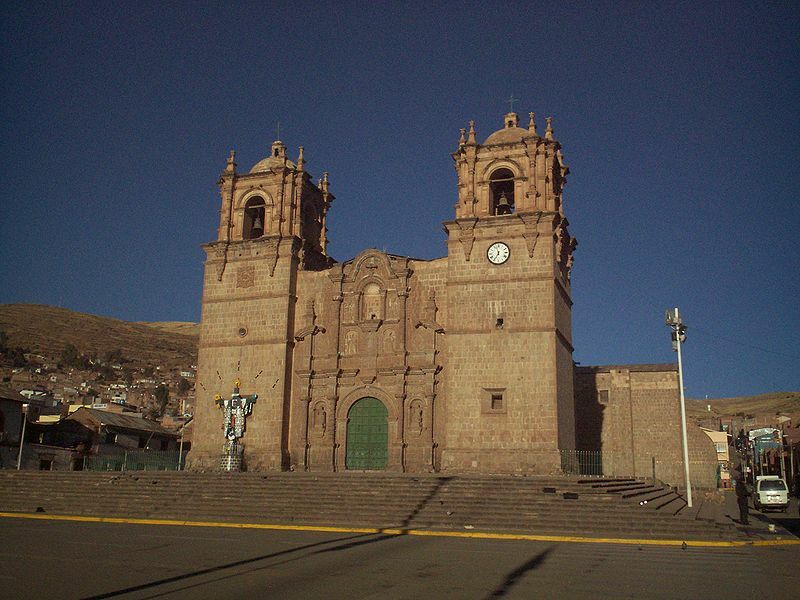 In 1668, viceroy Conde de Lemos established San Juan Bautista de Puno as the capital of the province of Paucarcolla. 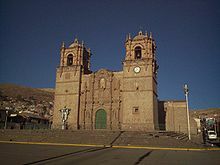 Later it was renamed to San Carlos de Puno, in honour of Charles II, the ruling Spanish king. In 1870, the railway route Arequipa-Puno was opened and navigation in Lake Titicaca began. The main attraction today is Lake Titicaca, the highest navigable lake in the world, covering 8,560 km² (3,305 sq miles) and a maximum depth of 227 metres (744 ft), between Peru and Bolivia. It is also known for the clear transparency of its waters. There are more than 30 islands, with a wide variety of birds, fishes and other animals. 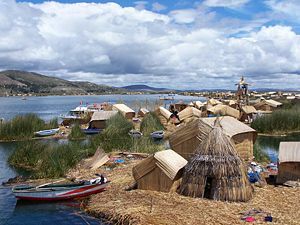 A group of 40 floating islands (Uros) formed by totora reeds, and the people living on them are one of the oldest cultures on the continent. They live the way of their ancestors, strictly keeping their customs and traditions. The local people on the Isla Taquile are farmers and have developed their own form of communal tourism and share their food, housing, customs and traditions with the visitors. The Isla Amantani has important archaeological ruins at the top of the hills. Most of these were sites were built for religious rites and adoration. 34 kilometres from Puno is Chullpas de Sillustani, another important archaeological area. A necropolis 4,000 metres above sea level is an esplanade surrounded by the beautiful lake Umayo. Built by the Collas, the chullpas, are quadrangular and circular edifices of over 12 metres (39 ft) high gigantic tombstones. The Cathedral, built in the seventeenth century, stands out for its beauty and carvings. The arched gateway, Arco Deustua, built as a memorial to the heroes of the struggles for independence. From the small hill, Cerrito de Huajsapata with a monument to Manco Cápac you can enjoy a magnificent view of the city of Puno and lake Titicaca. Other attractions of the city include, Museo Municipal Dreyer, Casa del Corregidor, Casa del Conde de Lemos, Fuerte de San Luis de Alba, and Santuario de Chancharani. Puno like many other Peruvian towns have many celebration, festivals and carnivals. 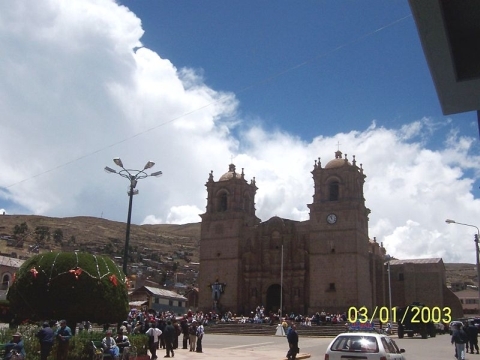 Our train journey, of more than 14 hours from Cusco to Puno was a memorable experience. The train chugged along steep mountains,valleys, and main streets of some villages. After exploring Puno, the surroundings and Lake Titicaca, our train went down to Cusco the same enjoyable journey.